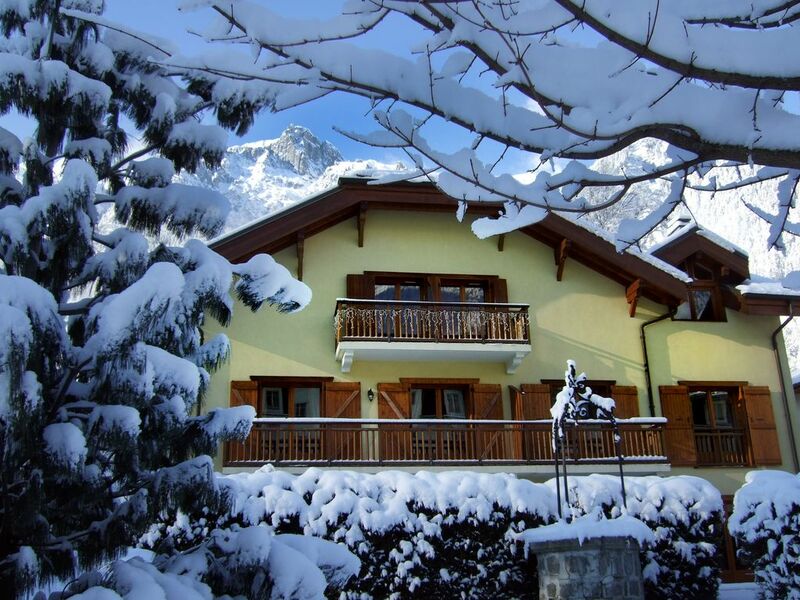 Duplex apartment on the 2nd and last floor in chalet in the center of Chamonix. High quality services. Exceptional views across the Mont Blanc. Very quiet. Individual closed garage + parking spaces in front of the cottage, no worries during your stay! Unforgettable vacation that will make you love Chamonix by finding you the evening around the old wooden bar American cuisine and comfort of the sofas in the lounge or gallery to be quiet to read or watch TV (2 TV). - enjoy the garden and do everything on foot from the chalet since we are located in the center of Chamonix while being in a very quiet place. (Dead end, secured by a fence) and sun all day. We confirm that you will be sad at the end of your stay to leave this beautiful valley of Ham! Detailed information sent by mail with rental agreement. == Beware of the anarchists, do not send anything without receiving my mail with all the info. 2 Bath: - The 1st level, shower and bath, hairdryer available with a separate WC - On the Mezzanine, 1 bathroom with shower and toilet. (Attached to the 3rd bedroom) - Towel radiators in each bathroom. We had a fabulous week in Chamonix. Great snow, great skiing, great nightlife and this great Apartment. The Apartment is equipped with everything you need for your comfort and convenience. We had every breakfast and evening meal there. The decor is charming and there is plenty of space for 6 people to relax in the evening. The bedrooms were a good size for the Alps with comfortable beds. The bathrooms appeared newly fitted and very clean. In fact the whole Apartment was spotless! The location is great too. A few minutes walk to the town centre and all that offers. The bus stop for access to the slopes is even closer! Despite being so close to the centre of town, the apartment is far enough away to be quiet at night. Thierry (Host) and Sylvie (Local Contact) were very helpful in the run up to and during our holiday. I have no hesitation in recommending this La Petite Savoyade for a holiday in Chamonix. Thank you very much David and hope that you will come back soon in our beautiful valley and our beautiful mountains in Chamonix !!! We had a great time staying at La Petite Savoyarde. Mr Babey kindly gave us a bottle of champagne and some beer which was much appreciated. The views from the balcony were amazing and as the roof overhangs it we could even enjoy going out there even when it rained. (It was mostly warm and sunny with occasional thunderstorms in the afternoons and nights).The stairs to the mezzanine floor were very steep and took some getting used to. It was a bit too hot on the mezzanine floor. There was mixed communication as to whether it was okay to open the velux windows, the one in the lounge wouldn't open, the one in the top bedroom did (we didn't try the one in the mezzanine lounge - this had great views of Aguille du Midi.) We had fun using the raclette set for one meal and also using the fondue set. We got a 9 day lift pass covering most of our stay - the longer duration you get the better the value. We enjoyed glacier walking and climbing with Peak Powder and also paragliding with the company based near the bottom of Plan Praz lift. Mr Babey and Sylvie were welcoming and very accommodating regarding our odd duration of stay (Monday to Friday) and our times of arriving/ leaving. We recommend this lovely accommodation which is in a great location. A very big thank your Natalie for your nice comment and maybe next time at La Petite Savoyarde! Good location. Great views. Well equipped, clean and characterful. Lovely place, beautifully decorated, fantastic location. We stayed here for UTMB week. Ideally situated, five minutes walk from start and town centre. Just far enough that the cheering from race finishers didn't keep you up at night. Apartment had all amenities you needed. A very high standard of furnishings and beautiful views of mont blanc. Highly recommend. Brilliant location, very quiet yet so close to the town centre. Super views from balcony. Good friendly communication prior to holiday. We've stayed in Chamonix a few times and this was the best accommodation so far!! Thank you very much for your kindness !!!! But stay in Chamonix, it's the Top !!! Our apartment is at the end of a quiet, calm guaranteed! You will also see before you a fantastic Panoroma with Mt Blanc chain as a backdrop. Simply sublime!